In this Raspberry Peach Cobbler recipe, mixologist George Carney paired a delicious fruit liqueur with sherry, cinnamon, and vanilla and enhanced it with fresh raspberries. 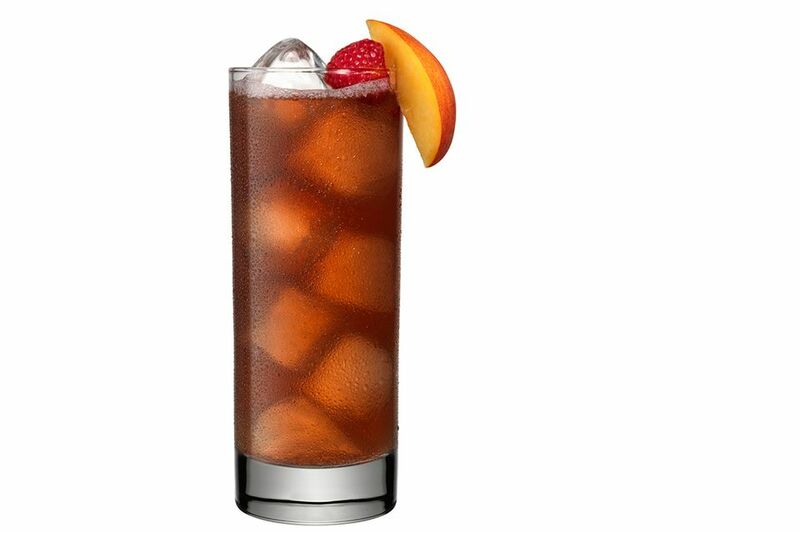 It is an easy and delicious drink inspired by the classic cobbler formula, that you can enjoy anytime. The liqueur is Grand Marnier Raspberry Peach, one of the brand's experiments in flavors beyond their iconic orange liqueur. It is a delicious spirit and is beautifully displayed in this simple cocktail. Though it is a delight year-round, the Raspberry Peach Cobbler is a perfect cocktail for summer entertaining when fresh raspberries are at their best. It is also a prime example of how delicious peach and cinnamon can be when mixed in the same glass. Combine the ingredients in a cocktail shaker filled with ice. Pour everything (including the ice) into a chilled collins glass. In recent years, Grand Marnier has been playing with new limited edition flavors. In 2012, they released Grand Marnier Cherry and 2013 saw the release of Raspberry Peach. It is a fantastic liqueur with everything you would expect from the brand. Sweet, delicious and filled with natural fruit flavors, it is perfect for creating unique and interesting cocktails. For the right recipe, one could even transform a Grand Marnier drink from the orange base into a raspberry and peach delight. The initial estimate was that the liqueur would be available through Valentine's Day 2014. A 2016 check on it reveals that it is still available, this time under the label Grand Marnier Signature Collection No. 2 Raspberry Peach Liqueur. It seems like the release was a success and they may continue its production into the future. A Cognac-based liqueur flavored with European raspberries and French red peaches. The Sherry: Manzanilla is a type of fino sherry. Finos are known for their pale color and dry taste with a hint of almond. Manzanilla follows suit and is produced in the Spanish seaside town of Sanlúcar de Barrameda. If you need to substitute the sherry, I would recommend staying with a fino. The Cinnamon Syrup: Poor Man's Kitchen makes an excellent small-batch cinnamon syrup that is perfect for cocktails. There are other brands available as well, KISS is a personal favorite. If you are in the mood for a DIY project, a homemade cinnamon syrup is one of the easiest syrups you can make. Simply add a cinnamon stick or two to the basic simple syrup recipe and allow it to steep for an hour or two after removing it from the heat. Cinnamon syrup is useful for a variety of mixed drinks and can liven up your morning cup of coffee. The Vanilla Bean: Vanilla beans are notorious for being expensive and their cost can make it tempting to skip that ingredient in this recipe. The cost is worth it because it is a finishing touch that balances out the drink's final flavor. If you want to get a little thrifty, cut the vanilla bean into smaller pieces (two or three per bean). Save the extra bits for the next round of drinks. The nice thing about this cobbler recipe is that the vanilla bean remains in the drink while serving. It will slowly add more of its subtle spice as you drink and it is quite lovely! The Raspberries: Raspberries come into season during the summer months. Don't let that stop you from enjoying this cocktail during the winter. It can be an excellent cold weather pick-me-up! Freeze a few quart bags of the fresh berries when they are at their peak. They freeze nicely and simply need to be thawed before mixing the drink. How Strong Is the Raspberry Peach Cobbler? Cocktails like this can be deceiving because we do not normally think liqueurs are as strong as a bottle of vodka. However, Grand Marnier is one of the exceptions and it is a full, 80-proof distilled spirit. If we mix this recipe using a 15 percent ABV Manzanilla sherry, then it would weigh in at around 21 percent ABV (42 proof). While it is not the strongest drink you can mix up, it is certainly not the lightest.